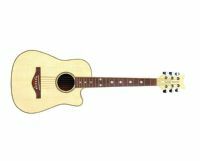 The Daisy Rock Wildwood Artist Acoustic/Electric guitar is a full scale instrument designed specifically for girls. The Stardust Elite Classic has rock attitude beneath its pretty finishes with a pair of high-output humbuckers for a rich, crunchy tone, and a mahogany body for a deep, dark sound. The attractive Debutante Junior Miss Acoustic is a quality acoustic guitar that’s available in a vivacious Bubble Gum Pink, Popsicle Purple, & Cotton Candy Blue finish. Designed specifically for females, the Rock Candy Classic guitar is sure to become your favorite axe! The Pixie Acoustic/Electric guitar is a full scale instrument designed especially for girls. This beautiful guitar is lightweight and it sounds great! The Daisy Rock Wildwood Artist Acoustic/Electric guitar is a full scale instrument designed specifically for girls. This guitar's "Slim & Narrow" neck makes even the most challenging notes and chords easy to reach for a girl with smaller hands. This guitar features set-neck construction for increased sustain and stability, mahogany body with a pearloid top, and Daisy Rock’s trademark "Slim & Narrow" neck which makes it easier for girls with smaller hands to play.